• Proposes the idea that important experiments in neuroscience can be identified and planned with the help of researchmaps. 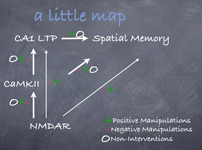 An example of a map summarizing information that implicates NMDA receptor function in calmodulin kinase II activation, LTP and spatial memory. The "+", "-" and "O" denote different types of evidence for each connection (arrow) in the map.